Heavymetalfoes Electrumite, the money card of the new set, and a major reason why we aren’t finished with Pendulum decks. Insanely easy to summon, two Pendulum Monsters is a turn one play most pendulum decks make. An immediate +1 upon the Link Summon, thinning the deck or getting something back from the Extra Deck. The search effect is great, but then you get the 1-for-1 search ability that is hardly ever a 1-for-1. The best Pendulum monsters give back upon their destruction, and with Electrumite popping one to search a Pendulum Monster in your Extra Deck, you are sure to be gaining major advantage. It doesn’t have to be a Pendulum Monster either. ANY face-up card on your field can be a target, including one you steal from the opponent. Mind Control and destroy. If you do destroy a Pendulum Monster, or one leaves the field you get a free draw. 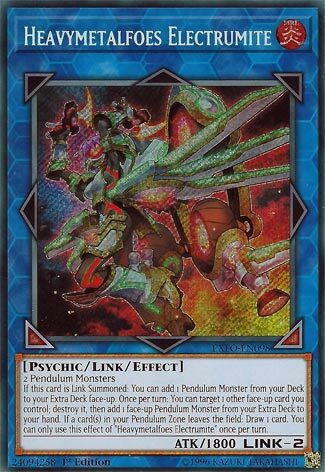 So we have a monster that searches upon Link Summon, searches when it destroys a face-up card, and gets you a draw when a Pendulum on your side leaves. All this usually happens in one turn. Wavering Eyes and this can mean utter destruction for your opponent. So many Pendulum decks can use this card: Mealfoes destroy themselves to search out for the deck cards to advance their plays, Igknights constantly destroy themselves in the Pendulum Zones to cycle through the deck and swarm, Mythical Beasts do the same as Igknights but with different effects, Magicians need a real booster after the banlist, and now Qliphorts are back at it again with the Towers at 1 and Saqlifice at 3. Oh, and it had strong attack for needing only two monsters for a Link Summon and has diagonal arrows, opening up your Pendulum Deck to Pendulum Summon to those zones. Its a near-perfect card. It isn’t for every deck, only if you run enough Pendulum Monsters, but for Pendulums it is the perfect card. Honestly didn’t think this card would become legal for the TCG so soon, but I am not complaining because it is an outstanding card, even though it did cause Pendulum Magicians to already be hit on the Forbidden and Limited List. Say hello to Heavymetalfoes Electrumite! Electrumite is a Psychic Fire Link-2 with 1800 ATK and arrows pointing Bottom Left and Bottom Right. Best arrows for a Link-2, ATK is ok, type and attribute are not too noteworthy. The summoning requirements are two Pendulum Monsters, very easy if you are playing Pendulum decks. When Electrumite is Link Summoned, you can take a Pendulum Monster from the deck and add it to the Extra Deck face-up. If there is something you really want to Pendulum Summon, Electrumite gives you access to that immediately. Once per turn, you can target and destroy a face-up card you control to add a Pendulum Monster from the Extra Deck to the hand. This is great along with the first effect to combo with Astrograph Sorcerer because then Astrograph can come back to the hand after you put it in the Extra Deck, then it can trigger to search for the same card you destroyed. Electrumite also helps generate advantage when you get rid of a card as well because when a card leaves the Pendulum Zone, you can draw a card. Funny enough, that is the only effect on this card that is a hard once per turn. Electrumite is great for Pendulum Decks to gain advantage. If you like Pendulum Decks, play this card.